I wasn’t sure I wanted to write about this. Not because I don’t feel a deep and humble pride to have this title. But because I feel this title is too sacred to splash it out into the world simply because it became a flash in the firestorm of an embroiled political debate. Unfortunately comments about our military are back in the news this week, so here goes my two cents (as they say). 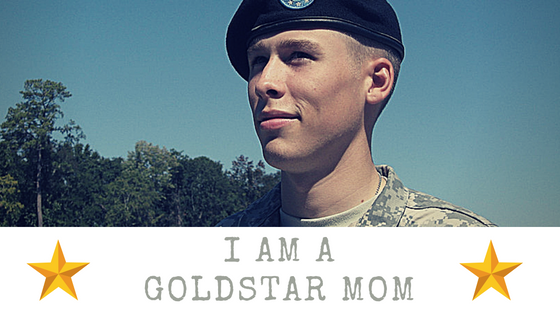 I became a Gold Star Mom in October of 2010 when my oldest son passed away while home on leave from the Army. We are, in some ways, a typical military family. My father was a World War II vet, my father-in-law a Vietnam vet, my brother-in law-served in the Navy and continues to serve our country, my husband is an Iraqi vet who is now a police officer. In other ways we fall the other way. I am a yoga instructor and honor the yoga tradition and philosophy as my guiding light. I’ve spent weekends at a practicing Hindu Ashram in the mountains. I burn sage, chant mantras and meditate. We love to quote the Dalai Lama – both his real quotes and our favorites from Bill Murray’s bit in Caddy Shack. We are a Gold Star Family. Before I launch ahead I want to be clear that this is not a political post or an endorsement for or against any party. It is my life and the lives of so many other parents like me. I’m writing this because I find myself at a crossroads. On one hand I am overjoyed that more people will know what it means when they hear the words “Gold Star”. Even with family who served I had never heard the term until minutes before being seated at my son’s funeral. A fully decorated high ranking officer (honestly I was so consumed with grief I can’t tell you anything about this man) stood before our family and handed us each a Gold Star pin. It was the darkest and most somber moment of my life. I’ve worn the pin dozens of times over the last six years and never, not once, has someone recognized it. So, yes, I am glad that the circus of this year’s election has shed some light on all who hold the title of Gold Star Mom. It’s brought so much more attention to this title that, for the first time ever, at a recent speaking engagement the organizer asked if she could introduce me as a “Gold Star Mom”. Yes, of course! On the other hand, it sickens me that the cultural awakening to this hallowed title will be forever tied to the most embroiled election year in the history of the United States. I fear it will forever be synonymous with Donald Trump. This post isn’t about him and I’m not about to give him the satisfaction of making it about him or his poor choice of words. Here’s what this post is about. Being a Gold Star Mom (or any Gold Star family member) isn’t a political issue or a political statement. I’m, a wounded healer, yoga instructor and probably considered a little ‘woo-woo’ for some. Those of us who are honored to have family who have served come from all walks of life, religions, and socio-economic backgrounds. Some of us have given the ultimate sacrifice and it is not attached to a political statement, party, or issue. Long after the election is over, we will continue to wake up every day and miss our loved one and feel the hole in our heart for that person. For us this isn’t about Trump v. Hillary, it’s a lifelong journey of healing and keeping the memory of our loved one alive. For the rest of my life I will celebrate Brandon’s birthday without him here. I will still feel that familiar pinch in my heart when I see the ROTC boys on campus in their uniforms. Tears will squeeze through the corner of my eye when I hear one of his favorite songs on the radio. I will swallow the lump in my throat when someone asks how many kids I have. In a few days, on Oct 9th, while the second presidential debate is happening – I will celebrating that day as my son’s last day here on earth. Instead of analyzing how each candidate does, I will analyze how good my memory is and see if I can still bring to mind the memories I fear I will forget. Like the time Brandon dressed up in my Dad’s World War II uniform on Christmas. I will spend it with my other sons and we will remember how our lives have been forever changed by Brandon’s life and death. When 2020 comes around and we are embroiled in another election year we, Gold Star Families, will still have an empty chair at our table at Thanksgiving. Memorial Day and Veterans Day will always be more about the sacrifice and less about the backyard BBQ for us. My hope is that your awareness of the words, “Gold Star” will grow roots and bloom long after the election year is over. I hope that eventually people will forget how they came to know this phrase, and focus on recognizing that anyone who holds this title has given the ultimate sacrifice. Those who hold this title have had someone taken away, so that, so much could be given back. I hope that it’s remembered with honor and without the attachment to a political party or a label of what a person believes just because they have connections to the military. We want you to remember our loved one, not the 2016 election. We want to know that our loved one’s lives mattered more than what can be tweeted in 140 characters or put in a sound bite. 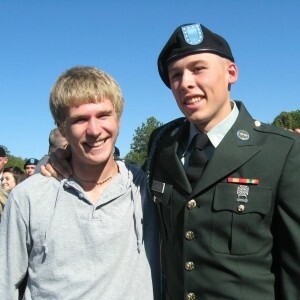 Thank you for sharing this painful post, my son served for 10 years during which time I lost his older brother to illness. I always dread the question, how many kids do you have. If I don’t acknowledge him I feel it betrays his place in my heart but it always requires explanation and some days I’m just not up to it. We honor you Gold Star families, its not a club any of us wish to join but we are so grateful for the service and sacrifice of your son, God bless you and his memory always. I thought of you; I wondered how that affected you. NOTHING will taint the preciousness, the utmost respect of that term for me, and I’m sure for others. I wish I could put your heart at peace on that. Because gold star moms are grieving moms. And grief is love. And love trumps hate. The meaning, the pathos, the value of your being a Gold Star Mom is in no way shadowed by this election mess. I can’t say when or where this term first entered my consciousness, but it was recent. You deserve the full honor of this designation, undimmed and unshadowed by politics or politicians. Forget them; Remember Brandon! Last year in September our eldest son Christophe was killed in a car crash. Full of grief and despair, I remember discovering your site, mailing to you and getting reply and comfort from you, as mother having lost a son as well. Today there is little more that I can do then telling you that we know and share how you feel and what you are going through, each time the date of the passing away of Brandon is there. dans la mémoire des vivants. in the memory of the living. Paula, what a beautiful tribute to Brandon. All of our family was stricken by Brando’s death. Please remember that as your cousin, I share in your grief. Brandon. Handsome. Funny. Caring. Gentle. Kind. Brave. Strong. Missed.